This happens to be a piece for a friend, requested by a friend. I am part of a group of (awesome!) ladies who rent a house in Lake Placid for a weekend every September to golf, hike, shop, eat, drink and enjoy each other’s company. There’s 13 of us. We refer to ourselves as the “Dirty Dozen”. Last year we ate out at one of our favourite places, “The Cottage”, but they couldn’t place us altogether all at one table, for obvious reasons if you’ve ever been there. Anyhow, Carrie’s table held only 4 of the ladies and as things do on those weekends, I think they got a little crazy together. Seems that they all decided to sign their bill and write silly things on it. 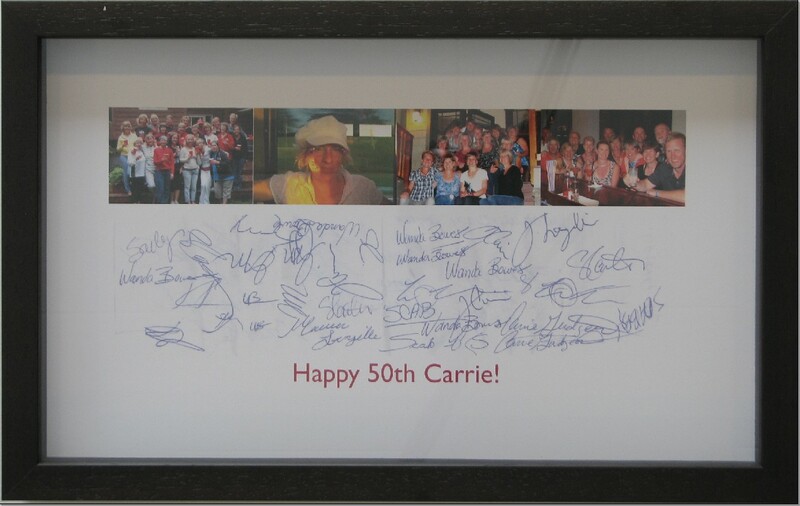 Carrie told Sally to keep it and that it should be framed…. Sally did as she was told. Well, she kept it and sort of framed it. 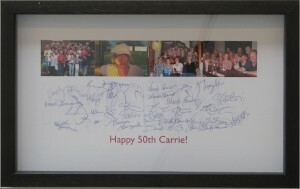 What Sally came up with was to have the receipt enlarged and printed out (on both sides just like a giant receipt) with photographs of Carrie and friends along the top on both sides. 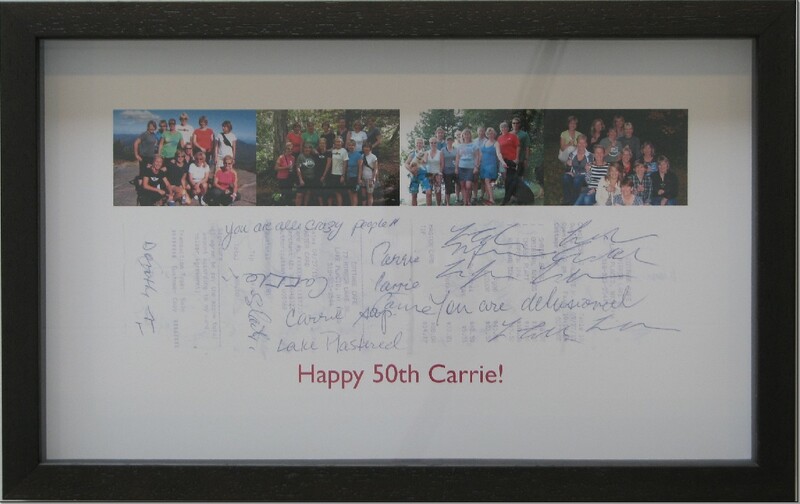 She also added a “Happy 50th Carrie!” along the bottom. She wanted to give it to Carrie for her birthday. Her vision had it framed between two pieces of glass. Here’s one side of the finished piece…..
Well because glass conducts heat and cold and there is a risk of condensation in a picture frame, we don’t like wedging things we frame between 2 layers of glass. Jimmy had a better idea. He made two identical frames, shadowboxed the UV inhibiting glass into both, carefully placed the enlargement on one and fixed the frames together with the double-sided “receipt” in the middle. 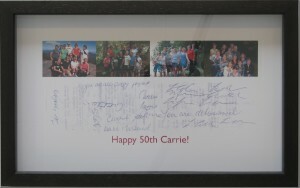 The frame, which was well received at Carrie’s party, will rest on a surface somewhere in Carrie’s house so that it may be picked up and enjoyed from both sides…. for her next 50 years!